The Art of the Handbag: Crazy Beautiful Bags, Claire Anthony with preface by Kathleen Dustin, Race Point Publishing, New York, 2013. Terra Nova: Polymer Art at the Crossroads, Rachel Carren, Bruce W. Pepich and Lena Vigna (eds. ), Racine (Wis.) Art Museum, 2011, pp. 58-67. “Polymer Clay: A Modern Medium Comes of Age,” Ornament, Vol. 34:4 2011, pp. 38 – 45 by Jill A. DeDominicis. “How Polymer Hit The Big Time,” American Craft magazine, October/November 2011, pp. 54 – 61 by Monica Moses. Masters: Polymer Clay, Rachel Carren (curator), New York, Lark Crafts, 2011, pp. 8-15. 100 Artists Of New England, E. Ashley Rooney, Atglen, Pennsylvania, Schiffer Publishing Ltd., 2010, pp. 176-177. The History of Beads: 100,000 BC to the Present, Lois Sherr Dubin, New York, Abrams, 2009, p. 342. “Holding Color In My Hands,” Connie Donaldson, Polymercafe, April 2008, pp. 14-21. “The Timeless Art of Crafts: The Smithsonian Craft Show 2000,” Diane M. Bolz. Smithsonian, May 2000, pp. 86-96. 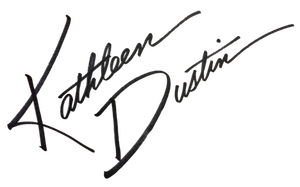 “Kathleen Dustin: A Polymer Clay Pioneer,” J. Tol Broome, Jr. The Crafts Report, April 2000, pp. 20-23. Foundations in Polymer Clay Design, Barbara A. McGuire. Krause Publications, 1999. “Movers & Shapers,” Lee Lawrence. American Style, Summer 1999. “17th Annual Smithsonian Craft Show,” promotional poster and cover image of program, 1999. “Designing Women,” Clifford Pugh. Houston Chronicle, Sunday, May 9, 1999. “New Challenges: Polymer Artists Work Precious Metal Clay,” Robert K. Liu. Ornament, Winter 1997. “Kathleen Dustin: The Journey Within,” (cover article) Carolyn Benesh. Ornament, Summer 1997. Artists At Work, P. Ashcroft & L. Haunani. Flower Valley Press, 1997. 1997 Polymer Clay Invitational Calendar. Creating With Polymer Clay: Design, Techniques, and Projects, Steven Ford & Leslie Dierks. Lark Books, 1995. Collectible Beads, Robert K. Liu. Ornament Inc., 1995. Creative Clay Jewelry, Leslie Dierks. Lark Books, 1994. The New Clay, Nan Roche. Flower Valley Press, 1991. Dedication and Foreword. The Guild: A Sourcebook of American Craft Artists, Kraus Sikes Inc., 1989. “The Use of Polyform in Bead-Making,” Kathleen Dustin. Ornament, Spring 1988 (Vol. II, no. 3), pp. 16-19.